Yashodhan Education Trust (YET) strives to impart basic and quality education to socio-economically deprived sections of Society. The Trust, established in 1978, under the guidance of Mr. Yadav and seven other trustees, started with ten students in a rented one room kitchen at a token rent of Re.1. The trustees contributed Rs100 each as initial capital to start off the School in the slums of Yashodhan Nagar. The idea was appreciated and as the number of students increased, the School was shifted to nearby premises atShastri Nagar in 1990. The School conducts classes from KG to Std X under Maharashtra Board for English and Marathi medium. The Trust charges minimal fees from the students as it believes in imparting education on a non-profit basis. The School has a well establishedscience laboratory, computer room and library. Health camps and annual day functions are organised regularly for the students. There are 1,084 students availing education in YET. Though YET has obtained permission from the Government for starting a Junior College, it has not been successful so far due to lack of finance and Government aid. Foreign Sources:Sonrisas De Bombay/Mumbai Smiles, a donor from Spain, contributed 49% (Rs3mn) of total income in FY13. 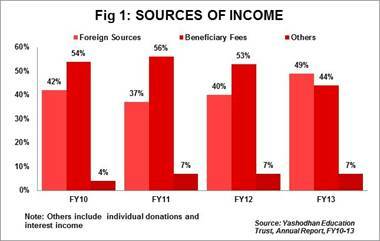 Foreign donations such as the above are routed through Karmayogand have ranged from 37% to 49% during FY10-FY13. YET faces a major crisis as this large donor has decided to withdraw its support from FY14till further notice,on account ofa recession in Spain. 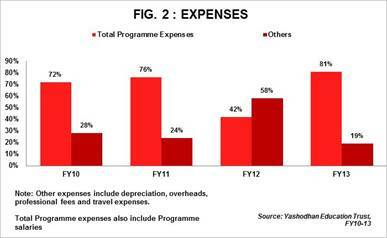 Total Expenses: Expenses totalled Rs4mn in FY13 of which 74% (Rs3mn) was incurred on staff salaries. Direct programme expenses(which include staff salaries) accounted for 81% of total expenses (sector average is 83%).It is normal to find that schools spend a high proportion of their expenses on staff salaries. The percentage is in line with other NGOs operational in the education sector – AmchaGhar (68%) and Door Step School (83%). Fixed Assets: Fixed assets accounted for 36% of total assets in FY13. Immovable assets account for 74% of total fixed assets as these include capital intensive assets such as school building and land. Investments: Investments increased to Rs5mn in FY13 from Rs3mn in FY12 and includes corpus funds invested in Fixed Deposits. Trust Corpus: YET has set aside a marginal amount of Rs0.3mn from FY10-FY13 towards Trust Corpus. Property Funds: YET plans to start a Junior College for Arts and Commerce. It has received approvals from the Government but lacks finance for implementing the plan. Hence, YET has started accumulating resources towards the building fund. Property funds constitute 38% (Rs3mn) of total funds in FY13. Self-sufficiency ratio: YET’s self-sufficiency ratio in FY13 is 83%. The ratio measures ability of an organization to meet expenses from its own funds. Own funds include individual donations, beneficiary fees, interest income and other income. Beneficiary fees (school fees) contribute a sizeable portion of total income of YET. Fee income: Income from school fees ensures regular inflow of funds. However, there are cases where the students are unable to pay the fees but are allowed to continue their education. This has resulted in arrears of about Rs0.1mn on accountofnon-payment of fees by some students. Dedicated Workforce:Inspite of various constraints, the teaching staff of YET has enthusiastically contributed towards the betterment of the students. In the past 35 years, YET’s dedicated staff has been its biggest strength. Total Income: Posted a total income of Rs6mn in FY13 Vs Rs5mn in FY12 recording an income growth of 18% in FY13. Lack of Support: YET lacks support from Government for its initiatives. The Schools are not aided by the Government and are run mostly on donations and school fees. Dependency on Foreign Funds: Though it does not completely rely on foreign sources, a significant proportion of the total income comes from foreign sources.. YET’s regular contributor from Spain has decided to withdraw its support from FY14,forcing YET to seek alternate means of funding. Lack of expertise: YET lacks networking and professional expertise, with which they can build more contacts.YETis not well versed with fund raising strategies.